Now kids can Set Friendship in Motion and imagine and play out adventures with Fisher-Price Thomas &amp; Friends Adventures, TrackMaster, MINIS and Wooden Railway engines all on the same track set! 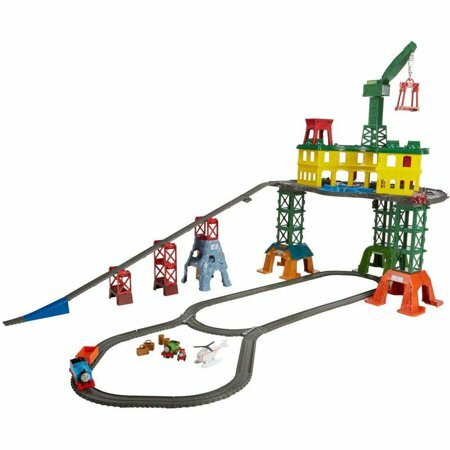 This multi-system track set with 3 levels of play includes Thomas (TrackMaster), Percy (Fisher-Price Thomas &amp; Friends Adventures), James (MINIS) and Harold. In addition to being able to use most Thomas engines, multiple configurations allow for layouts that can fit any space in the home. 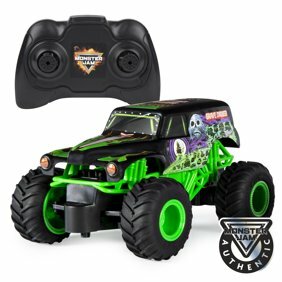 I bought this for my 3yo son as the "big" Christmas gift last year. First off, it's HUGE; it almost nearly covers our entire 5x7 rug. But my son absolutely LOVES it and has played with it every day going on three months now. We've configured it to attach tracks at the bottom of each ramp so that it's a never-ending ride, and even I enjoy helping him think of new ways to utilize the features. Especially love the numerous places to hang extra trains and cars. Great quality product; very much recommend. Dream Toy for Thomas Lovers! This was one of 5 items my 4-yr-old son requested for Christmas and he absolutely loves it. I love that he was able to help assemble everything because the peices were that easy to manipulate. This train station was a huge hit with my 3 year old nephew. His little face was so excited when he opened this fantastic gift. He loves everything about Thomas the Train and will play for hours with his friends. I do not have one complaint about the Super Station. It's a great value for the price. Our kids wanted Super station for Minis. We own quite a lot of old Trackmaster trains and tracks and some new. It is an impressive set. Holds some interest for maybe half an hour. Like everybody states battery operated trains derail down hill. In order to close loop on the bottom and not derail, we added at least one full straight and one half length straight before closing the loop. Now; the extra tracks we used are all new type (also connectors for the old type are also provided in box), but are different from Super station tracks. On new normal tracks minis and midi trains can't operate (they get caught between high tracks ridges), the battery ones drive without problems. 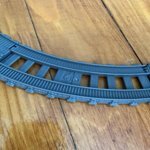 Wish Mattel puts this Super station ridge tracks on market. Also the top level is kind of uninteresting. It would be perfect if it closed a circle so non battery operated trains can go in loop. It is still a very nice set with limited possibility for expansion. Also old trains can't go up the new track hills, as well as new trains can't go up the old track hills even with bottom adjustments. That would be not much of a problem if they made better selection of new r/c operated trains. This set is probably the most interesting that is now available on market. Thank you for taking the time to share your thoughts with us. We'll be sure to pass them along to our design team. I bought my son this set for Christmas and he absolutely loves it, but I'm noticing a problem with the track “CS” pieces. They aren't grooved enough for train wheels to catch and always stall his train engines no matter what one we use. The other sets we have bought him previously work perfect but these aren't the same. Very dissatisfied as a parent. I've included a picture of the “old” CS corner piece and one of the new corner piece, other than that he has a blast with the super station! But I feel like he should at least be able to have a working train go on the track without assistance. My husband and I bought this set as a Christmas present for my two boys who already have 3 other (smaller) Thomas playsets. Because this set is supposed to be compatible with Thomas & Friends Adventures, TrackMaster, MINIS, and Wooden Railway engines, we thought it would be a wonderful way to bring the boys' multiple sets together. Unfortunately, the TrackMaster engines do not transition from the “closed” tracks that come with the SuperStation to the “open” tracks that come with the other TrackMaster playsets, and the transition pieces do not make a difference. We have tried to set up different patterns with the tracks over and over, but the TrackMaster engines continue to derail. When we saw the SuperStation set at the store, the pictures on the box lead a purchaser to believe many sets can be combined for endless play, but the pictures do not represent the limitations of the SuperStation.